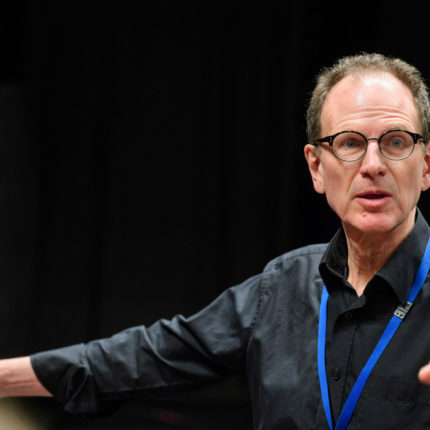 After a successful decade leading the Music Education Hub in Lewisham, Peter Hayward, Chief Executive of Lewisham Music (and previously Head of Lewisham Music Service) has announced that he will stand down in August 2019. Peter has overseen a period of innovation and growth, developing programmes and platforms which have enabled thousands of children and young people to take part in music-making activity each year. He played a major role in establishing Lewisham Music as an independent charity in 2017 and in securing a new home for the charity at the Fellowship Inn, an exciting new arts and cultural facility for the borough open from April 2019. Lewisham Music is well-placed to take advantage of the exciting opportunities ahead of it and the Board of Trustees has expressed their appreciation for Peter’s very significant contribution and insightful leadership. Peter’s contribution to the musical life of children and young people in Lewisham has been extraordinary, and he will be greatly missed. His vision and resolve has underpinned Lewisham Music’s excellent reputation within the borough and across London. He has been an inspiration to work with and this influence will be felt by the organisation for a long time to come. I am hugely grateful to our trustees and to our management, business and tutor teams for their skill, enthusiasm and energy. There is a superb workforce of music teachers working in our borough schools too, and the support of school leaders, our many partner organisations, Lewisham Council and Arts Council England is vital to sustaining and enriching work. Thank you to them all. The quality and diversity of music making across Lewisham is outstanding and I consider myself very fortunate to have been a part of it. Most of all, I shall miss our fabulous young people whose music making in their schools, in our centres and on a vast array of concert and festival stages within and beyond the borough has always been a joy and an inspiration for me. Their music will stay with me forever. The Board will now begin the process of appointing Peter’s successor and will publish details of the recruitment process in due course.